In September 2000 I was able to go to Las Vegas for a week. There I visited Tim Arnold, who (probably ?) 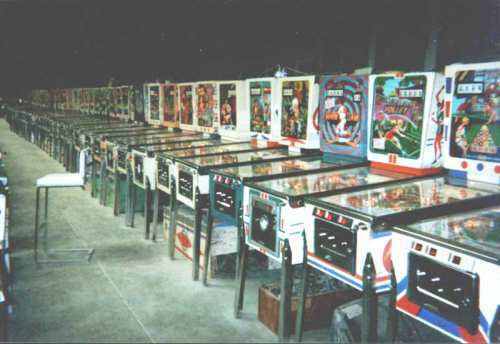 has the largest collection of pinball machines in the world. I had heard about him on the rec.games.pinball newsgroup, and was able to arrange a meeting with him. After giving me a tour through the part of his house where he stores some spare parts, backglasses, .. and gave some explanation about how he fixes pins, we went into his garden. The quality of the pictures isn't very good - they were taken with a disposable camera and scanned in. But at least you get an impression how huge this collection is. Pictures don't do justice to the size of his collection.. just try this at your house: count pinball machines. Measure the width of one pinball machine. Then add a second, a third, and keep on walking until you have the distance of 50 machines next to each other. That's the length of each of these rows ! 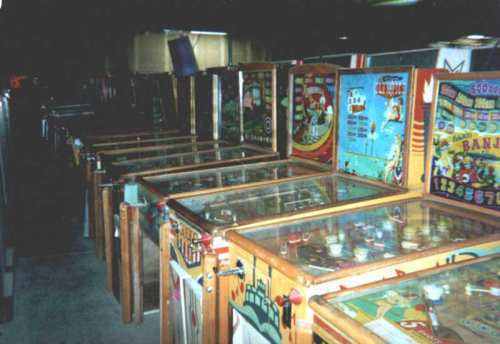 Here's a row of old pinball machines. Tim restores a machine in one week. He takes it apart, cleans all parts, changes worn parts, ... I asked him about repainting cabinets or fixing scratches but his answer was he didn't do these things (unless the cabinet was really trashed). ie. he also won't touch up initials carved in a cabinet. 'spend your time on the important parts of the game that affect gameplay, like rebuilding flippers and waxing your playfield'. What he does repaint are all coin doors. A nice row of wedge-heads. About 50 next to each other. At a pinball a week, about one year worth of work.. Notice all pinball machines stored underneath those pins.. he has more then 300 machines fixed and set up for play.. but he has at least double of that amount of pinball machiness stored that still need his attention ! 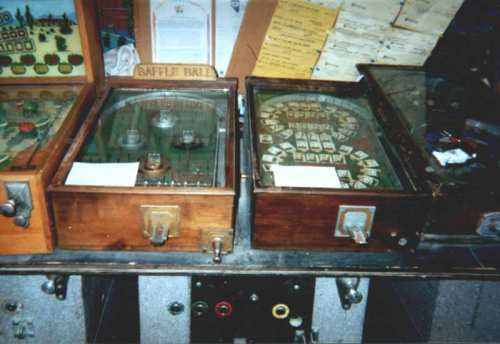 Another two years of work standing here..
His oldest pinball machines, Baffle Balls of 1931 and 1932..
Tim wants to open a pinball museum, the 'Pinball Hall of Fame' and is raising funds for this goal. He's been working on this project since a few years and I have no doubt that it will become reality. More information about it can be found on the the pinballmuseum.org website. Some older pictures of Tims collection are available here. They're made by Clay Harrell. Clay and Tim have since then worked together creating and selling videos about pinball machines and repair. All profits of these dvds go towards the Pinball Museum fund. Here are some more pictures of a 'Fun Night' at Tims place, when people can visit the Big Shed. If you are interested in repairing pinball games, the TOP tapes which are also sold at this site are a must ! They give very good information about repairing pinball machines. Although most of this information is available online on the internet (at Clays own repair guides), seeing it done is so much more informative then just reading about it. 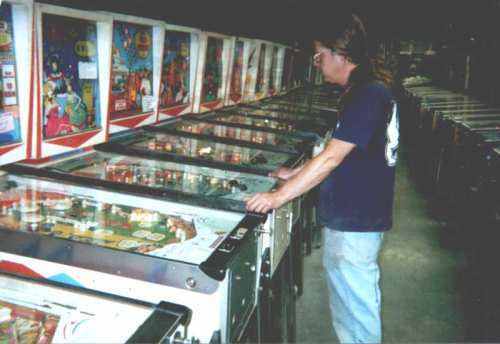 Finally, for an impressive view of Tim's collection, check out the Pinorama views at OCPinball website. 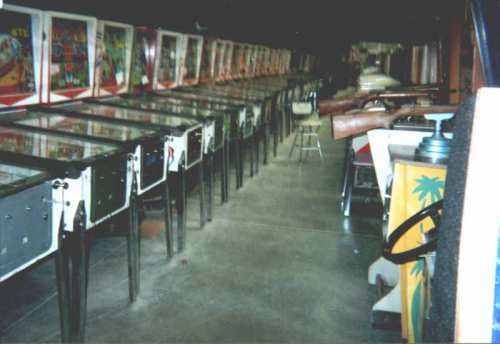 This is about the best view you can get from the collection without actually going to Las Vegas..
Update 2006: the Las Vegas Pinball Hall of Fame is open ! For pictures check out this website. Also check theit official website at www.pinballmuseum.org. The Pinball Hall of Fame is even mentioned on the Gottlieb Pinball Hall of Fame Playstation game ! Available for Playstation2 and PSP, you can play a lot of classic Gottlieb pinball machines, and in the credits they talk about the Pinball Hall of Fame in Las Vegas.